The computer mouse dates back to the advent of the Graphical User Interface, or GUI (pronounce “gooey”). You see there once was a time, before the GUI, where you interfaced with the computer through text commands. It wasn’t very personal or usable. For the most part if you wanted to use a computer you needed to be a computer programmer. The mouse gives you control over your computer. With the mouse in your hand you cause the onscreen arrow to move around your computer display. It is based on the “point and click” philosophy. You move your mouse to a point where you want something to happen, then you click to make that event take place. Sometimes you click once. Sometimes you click twice. And sometimes you hold down the mouse while your event is happening. 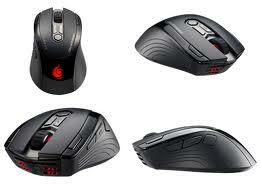 Most mouse devices give you two opportunities for clicking. There are both right and left areas to depress. The left area is generally used for issuing commands to your computer. To access special menus (known as context sensitive menus) use the right portion of your mouse. When you use your mouse for word processing, you will find that it sometimes changes shape. Please look at the example on the right. By default there is a white arrow that points to the left or right. This enables selection of command options. Pressing down on the left-mouse twice in rapid succession produces a double-click. Generally you double-click to open an onscreen object. In this illustration the "My Computer" object to the right is dimmed, indicating a single click has activated it. If you click on the dimmed object, your action will open the file represented by that object. Sometimes the mouse makes things happen simply by moving around the screen. A mouseover occurs when an onscreen image changes as your mouse travels over it. In the example to the right the active link will change color as you move your mouse over it. As you practice with your mouse you will notice two other characteristics. Once is the concept of key depress and key release. By clicking once (depressing the left mouse, then immediately releasing it, you cause an onscreen event to happen). In the Flash animation file to the right, use your mouse to depress once and release on any of the buttons. The key depress action causes an onscreen event to take place. You can also sometimes click and hold down the left mouse. This would be the case when you want to highlight a section of text by moving the mouse over it, or when you want to move an onscreen object using your mouse. In the example to the right you would left-click, then hold down the mouse while you drag across the area you wish to highlight.